Over The Baggy: Should Ben Revere play center? Should Ben Revere play center? Before the spikes have even hit the turf at Hammonds Stadium, manager Ron Gardenhire has gone on the record as saying Denard Span is his 2012 center fielder. "[Span's] going to lead off and be my center fielder. That’s my expectations. If somebody were to tell me that he’s not able to do that, then we’d have to ad lib. But if Denard comes in healthy, then he’s my center fielder, there’s no questions to me about that." Apparently, Ben Revere, who performed admirably in center in Span’s absence, was just keeping the position warm for the incumbent. There is probably little doubt that Gardenhire is basing some of his decision on the fact that Revere has a substandard arm. From the wisdom of the crowd, Fangraphs.com polled their readers to compile a collective scouting report on all players. Their contingency gave Revere’s Arm Strength a 4. This was by far the worst rating among all center fielders and a 90-point difference between him and the leader, Rick Ankiel. Also viewed critically was his release: the Fangraphs.com crowd said that his release rated as a 28, the third-lowest mark in that category too. 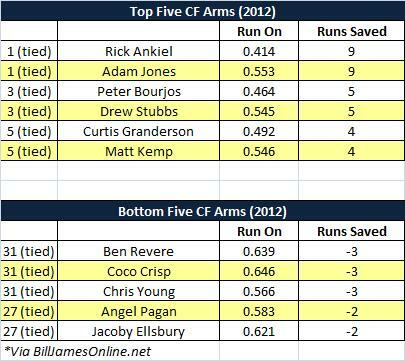 It doesn’t take advanced metrics to recognize that Revere has a weak arm. It takes a bit more scouting acumen to see that he has a long arm throw which delays his release. Combine these two factors and it equates to extracurricular activity on the base paths. The question is what did Revere’s skill set cost the Twins and does it preclude him from being the starting center fielder? 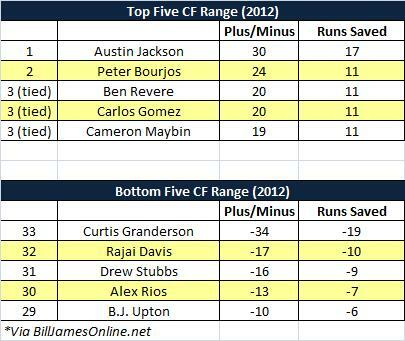 According to BillJamesOnline.net, the website which warehouses a vast majority of the Baseball Info Solution’s defensive data, they peg Revere’s arm as the worst among qualified center fielders in 2012 (minimum 700 innings) – adding data to the fan’s observations. He managed to accumulate 3 kills (throwing out runners) but allowed 63.9% of runners who had an opportunity to advance to the next base did so during his watch. Here’s what we know about Revere: He’s fast. Because of this, we might also assume that he gets to many balls quickly, even those that fall to the ground. If he can get to more balls quicker than slower center fielders like, say, Rick Ankiel, one would think it would have some effect in preventing coaches from sending runners around the bases. Until we have other data available like how quickly an outfielder gets to a ball or how much velocity someone throws or how quick their release is, we are simply not going to have a comprehensive overview of how to judge someone’s arm. Still, looking at how many times opposing teams have had the opportunity to advance a base on him (89) versus how many times they decided to move up (56), you have to reach the conclusion that Revere’s lack of an arm has an adverse affect even if he is able to get to the ball quicker than the rest. Allowing runners to move up has been the crux of the argument for those wanting to keep Revere out of center. After all, in addition to patrolling the deepest part of the field, a center field has one of the longest throws to home plate among the three outfield positions and has a hefty chore when throwing to third base as well. In Revere’s case, opponents took note of his arm strength last year and used it to their advantage, wheeling around second-to-third or third-to-home. Understandably, if opposing teams recognize this opening, they will like walk through it at a high rate and put themselves in scoring position whenever possible. That idea certainly makes a manager cringe but, ultimately, it might be the wrong thing to focus on when deciding who should man center field. Moving Revere to left field definitely cuts down the distance on the throws, giving him an opportunity to cut off runners advancing to third or home. On the other side of the coin is the fact that Revere can cover ground like no other. Last year, Revere finished tied for third in Plus/Minus among center fielders with a plus-twenty (+20) mark. That means he was 20 plays better than the average center fielder which added up to 11 runs saved. What this boils down to is that by the Plus/Minus system, it is much more valuable to prevent hits than it is to allow the opposing team the opportunity to move into scoring position. In terms of his arm, Revere has spent the offseason trying to improve in that area. Revere told 1500ESPN’s Judd Zulgad and Joe Anderson that he has been throwing “long toss with a football” to build strength. And while he may be able to add a few MPHs, his long arm action still needs to be pared down to shorten his release time. Additionally, there are no real precedence set to say how much a player’s arm can develop over an offseason so there is no way of telling how much Revere can improve his arm. To be sure, Denard Span is no slouch in center himself, especially in his 500-plus innings there last year. While he was not quite at Revere’s catch ‘em all caliber, he managed to save six runs which ranked him as the 11th best center fielder according to the P/M system. In the end, moving Revere out of center may play towards his lack of arm strength however it might wind up costing the Twins some outs when he is no longer patrolling the spacious center at Target Field. I think Gardenhire's comment about Span being his center fielder has more to do with Span than it does with Revere. Being a player's manager, to him, means sticking with the veteran until the veteran loses his job, not holding competitions for positions on a level playing field. Even in the unlikely event you have an accurate measure of how many balls Revere will get to in center field, how many more balls will that be than he will get to in left field? He and Span can certainly shade toward right field to help out Willingham. Even in the unlikely event you have an accurate measure of how many balls Revere will get to in center field, how many more balls will that be than he will get to in left field? It's not about what he can get to but more importantly it's the number of chances he'll get. Consider the fact that in the AL, center fielders had - on average - 100 more chances hit in their zone over left field teammates. In 2011, Twins CF had 478 chances. The LFers had 355 chances.In 2010, the CF had 448 while the LF had 294. In 2009, CF had 492 while the LF had 356. To me, I'd much rather have the fielder better equipped to chasing down more of those. Good research, Parker. I had blogged about this generally before, but it's nice to see some numbers to support the idea that Revere's speed and number of catches made would outweigh the extra bases taken on him over the course of a season. Having Denard Span play center over the most exciting center fielder in baseball is a joke, quite frankly. Left field does not require the athletic player like center field does. Also, so Span is a terrible center field general. For every time he makes a great catch, he allows 2 to drop in the gap because of poor communication and effort. Span is average, at BEST. Revere made two of the best catches of the year, and Jim Palmer said the catch over his head was one of the best he had ever seen. I really like to do with your site and I also frequently visit your site because I really liked what you hope to share more information that you can share.